Today we’re going to heading to Greece for some happy glutton time. 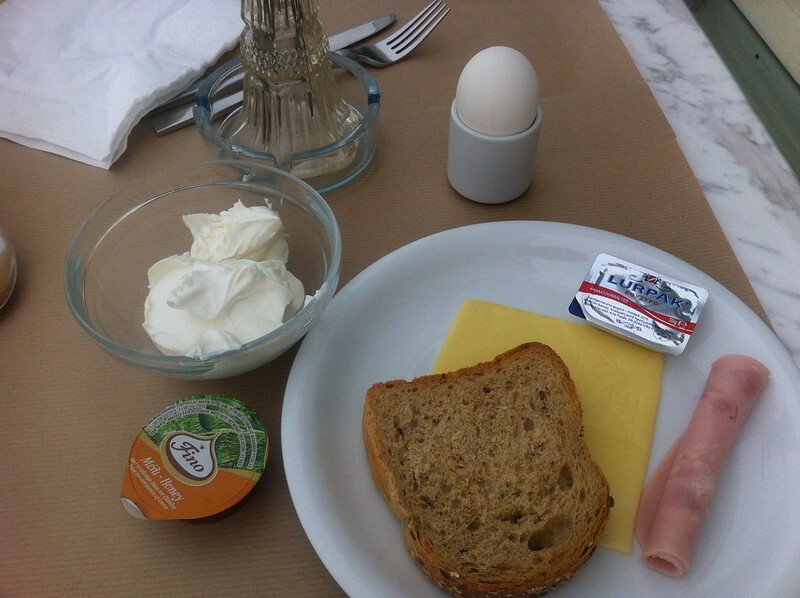 Before I went to Greece, I had no idea what the people ate. I know from the myths that the gods eat ambrosia and nectar but I was pretty much clueless about what the mortals ate. I imagine they ate a lot of olives since Athena gave the Athenians the olive tree. 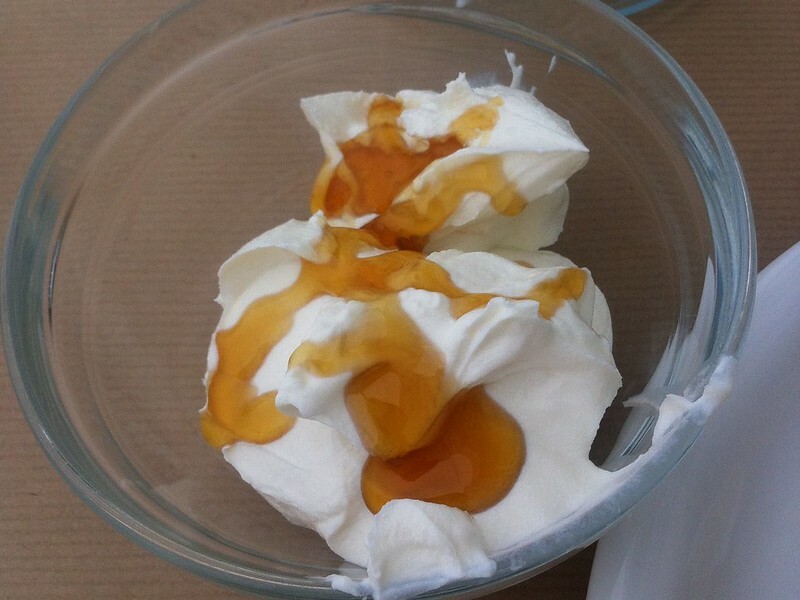 Is Greek yogurt really greek or is it just a marketing label? I do like yogurt but I’ve never a fan of olives. It’s just too salty and tiny to be satisfying. 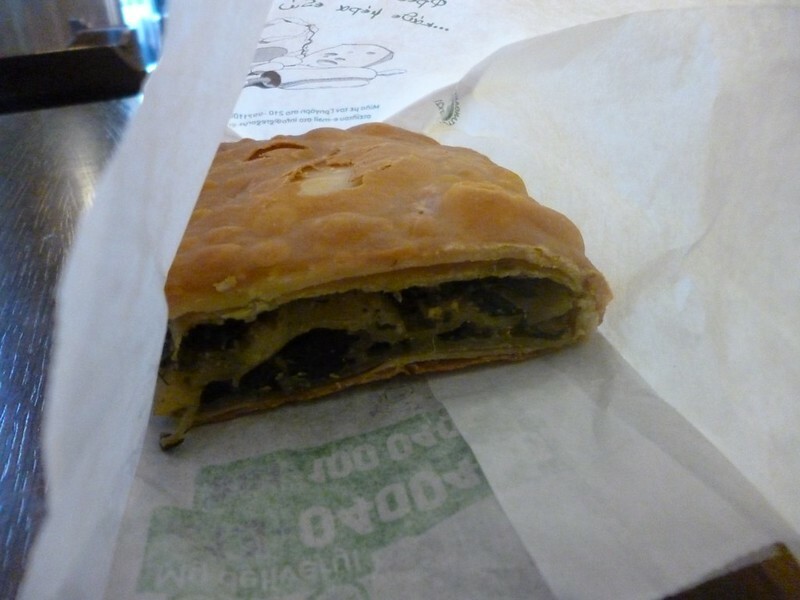 Fortunately when I reached Athens, I found out that Greek food wasn’t all about olives. I even had meals that were so good that I was willing to stay and eat that for the rest of my life. After I took a bite of my first pita gyro (pork), I knew I could stay in Athens forever and not get bored with the food. A gyros is a bit like shawarma in Dubai but there is a choice of pork. For the people living in Malaysia and Singapore, a pork pita gyro is a bit like eating Chinese roasted pork wrapped in a roti canai/prata. The first place I had a gyro was at one of the shops opposite the central market. The dish came hot. Pita wrapped the roasted meat, french fries and salad so snuggly that I didn’t mind I was eating raw vegetable. I love drinking coffee. 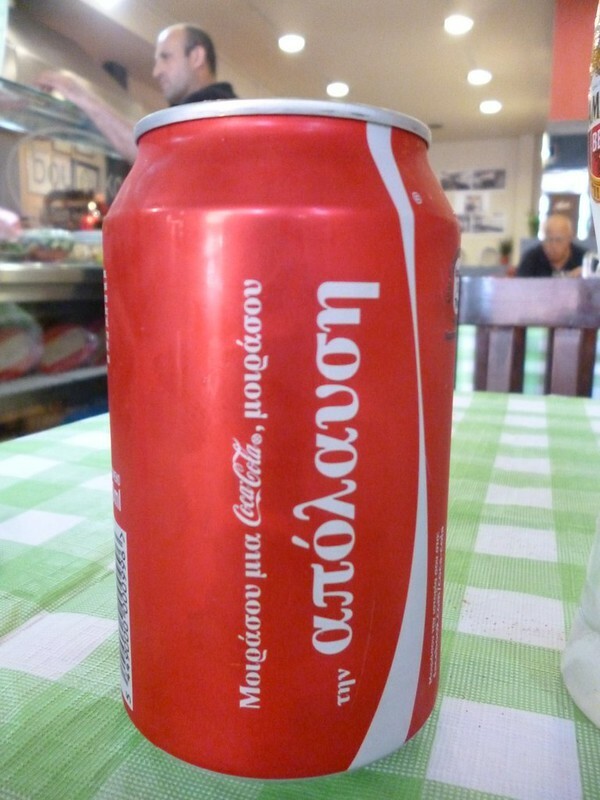 When I found out that it was a Greek who invented frappé, I knew what my default drink in Greek would be. 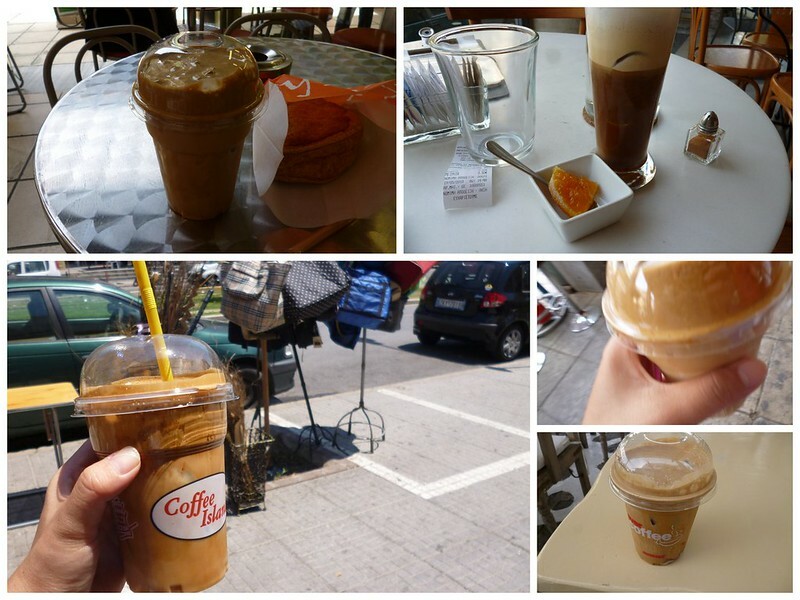 The Greek frappé is unlike anything I’ve ever drank. The coffee powder, milk powder and syrup are all whisked by a machine with water added in later. A thick firm foam appears at the top and would not dissolve even after a very long while. If you taste the foam, it is sour but the drink itself is sweet. What usually happens is that I finish all the liquid and have remaining foam and ice cubes. I wait for these to dissolve or melt before I sip on the sour remains. I hate eating raw vegetable. When I saw the salad that came to me, I almost pushed it away. Then I spotted a white chunk of something that looked curiously like tofu. I nibbled on it and found out that it was salty and tasty. Using that unknown white block, I covered the taste of raw vegetable and finished all my bowl. Thank goodness a Greek salad didn’t have a lot of raw greens. Later I read that the tofu-like food was feta cheese. Clever old me went to Carrefour and bought a pack of feta cheese. 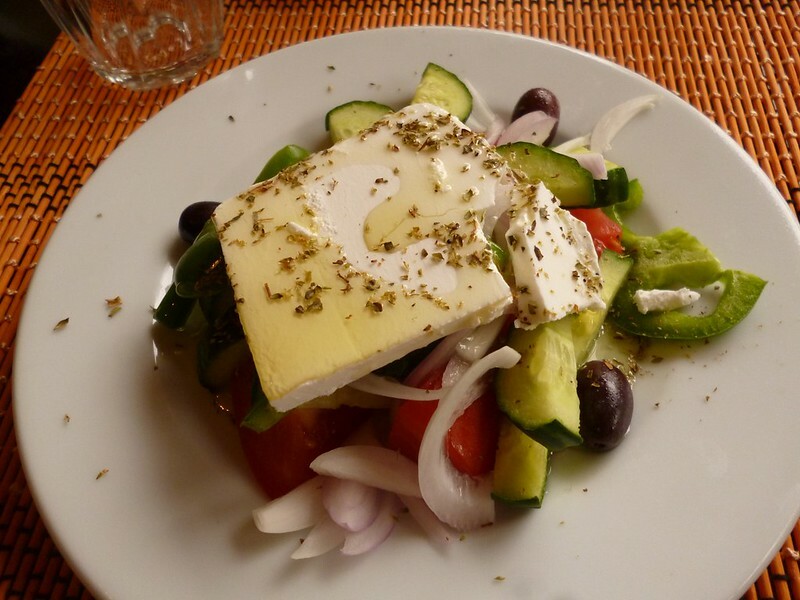 Unfortunately, I found out the hard way that feta cheese on its own is too salty to be consumed as a main meal. 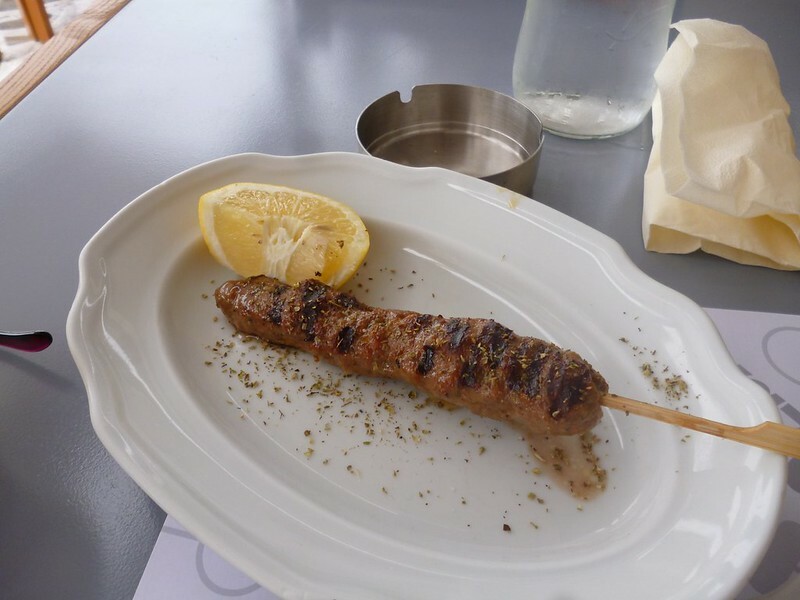 The Greek version of satay has a lot more meat on a thicker stick but is also more expensive than a regular stick of satay. 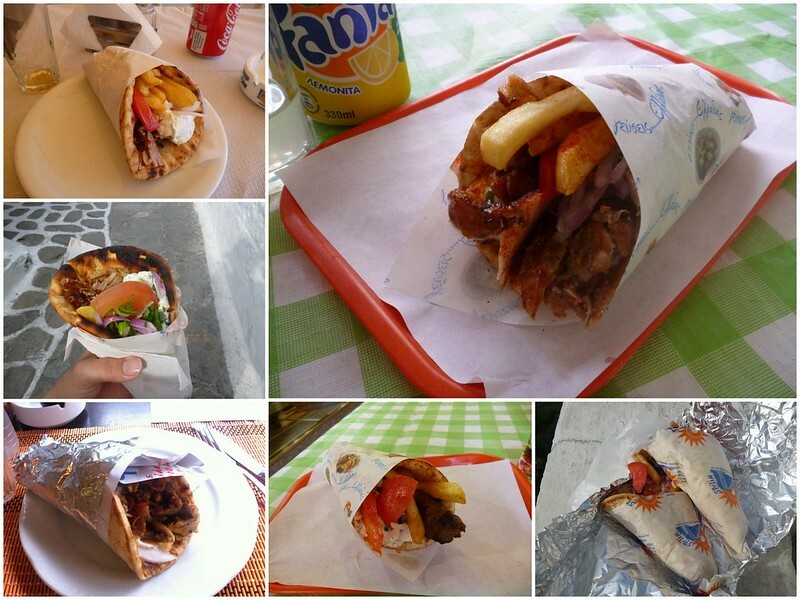 Compared with gyro, I didn’t eat that many souvlaki when in Greece. I like it but it’s not as satisfying as roasted pork. Yum yum. 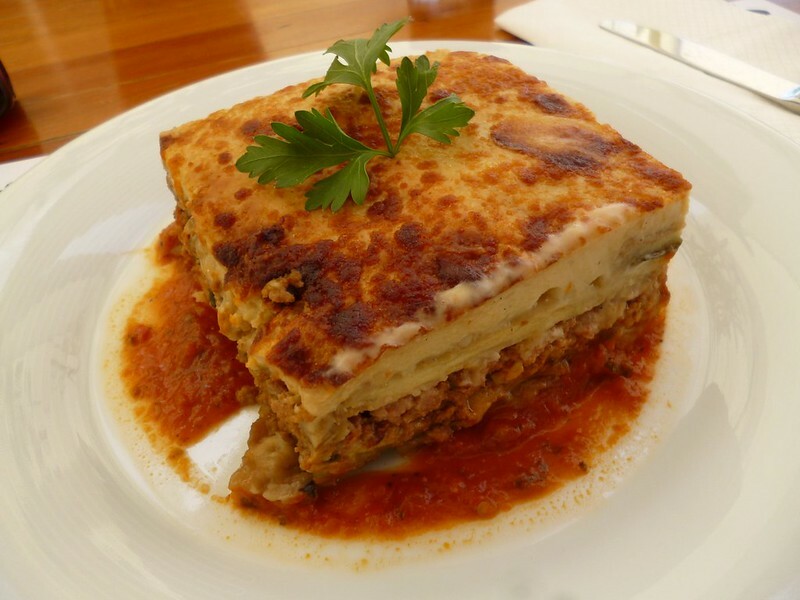 When I had the moussaka, I thought it was like lasagna but parts of the pasta replaced by eggplant. The large rectangle contained layers of eggplant, minced meat, cheese and pasta. it was as rich as a lasagna that by the time there was only 3 bites left, I had to stuff the rest into my mouth reluctantly. 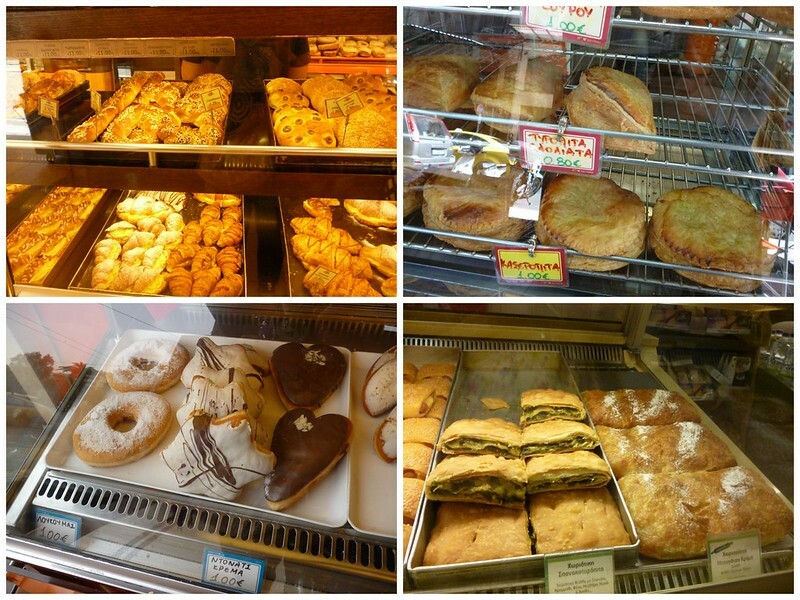 At the little cafes, there was always loads of pastries on display. I usually randomly choose any one of them and nod as if I knew what they were. I’ve never really been a savory pastry person so all the pies just tasted normal to me. 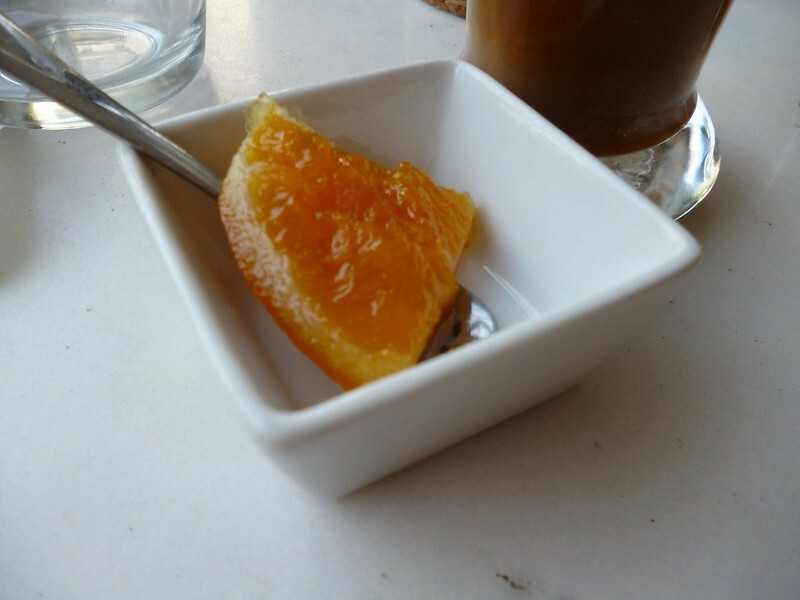 At one of the cafes, they served a sugared orange slice. It was delicious! The tangy and bitter orange peel mixes well with the sugar coating. Even though I want to drink something local with my meal, I always ended up with a Coca Cola because it was the easiest thing to choose. I’m not typically a fan of greek food, but these pictures have changed my mind. I need to go get a gyro! Please order a gyro for me too! I’m half Greek and I miss the food in Greece. I lived on those pies when I was there. I also got them in Israel.